In 2013, ninety delegates from 31 walled towns from 10 countries across Europe attended the 23rd annual meeting of European Walled Towns. From Ozmanagazi, Turkey in the east to Bandon, Ireland in the west, from Narva, Estonia in the north to Valetta, Malta in the south, the geographic range of Europe was represented. The Symposium asked the question: ‘Has heritage a role to play in the recovery of the European economy?’ It was an opportunity for local authorities and heritage organisations to share best practice in conserving and exploiting the cultural and economic value of their town walls. Equally importantly, the symposium was a statement from our sister cities and towns across Europe that Derry’s Walls are part of a shared European heritage resource. Other walled towns in Ireland, from Bandon to Carlingford, were also at the Symposium and the Minister for Arts, Heritage and the Gaeltacht, Jimmy Deenihan TD singled out Derry City Council for being one of the founder members of the Irish Walled Towns Network. Michael Starrett, CEO of the Heritage Council of Ireland was forthright in his view that communities have a key role to play in the stewardship of Ireland’s heritage: ‘The Heritage Council is a organisation which seeks to provides frameworks which give back responsibility for the ownership of heritage to the people who know and value it best – that is the people, the length and breadth of Ireland.” Arguing against a tradition of believing that only experts should be involved in the stewardship of heritage, Michael Starett confessed his organization had occasional frustration at agencies which did not embrace this new approach fully or that were content to use Ireland’s heritage as a marketing tool without investing in its conservation and ongoing management: “It is cost effective. It is led and valued from the bottom up so it is also durable. It is not done simply because there is a whim and a project to complete. It is deep rooted in what is referred to more and more often as the distinctiveness of our Irish Cultural Heritage. And if our walled towns are truly to play their part in driving not only economic recovery but our economy this is the type of approach that needs to be adopted. The heritage we are seeking to promote in terms of value and significance is not the preserve of experts rather it is informed by them. It is not the heritage of imposition and directive rather it is the heritage of sharing knowledge and understanding and empowering and trusting communities to manage and conserve and enjoy their heritage. Carole Souter Chief Executive of the UK Heritage Lottery Fund claimed that heritage enriches our lives. Using the Walls of Derry as an example, Carole Souter explained that today’s heritage buildings have seen their use change over time as new generations find fresh meanings for them: “ The Walls of Derry can be seen in a number of ways. They are protection or they can be seen as an obstacle. They provide safety or they could be seen as providing a threat. They are exclusive or they are inclusive. Every building, every aspect of our history has so many different ways of looking at it and there are various meanings depending on where you are in relation to that history and heritage. Carole explained that the forward plan for the Heritage Lottery Fund will focus on projects which link people, communities and heritage. Would putting in place a plan to achieve UNESCO World Heritage Status for the Derry Walls or the wider Walled City be a valuable legacy from the City of Culture Year? Creating a heritage legacy from Cities of Culture. 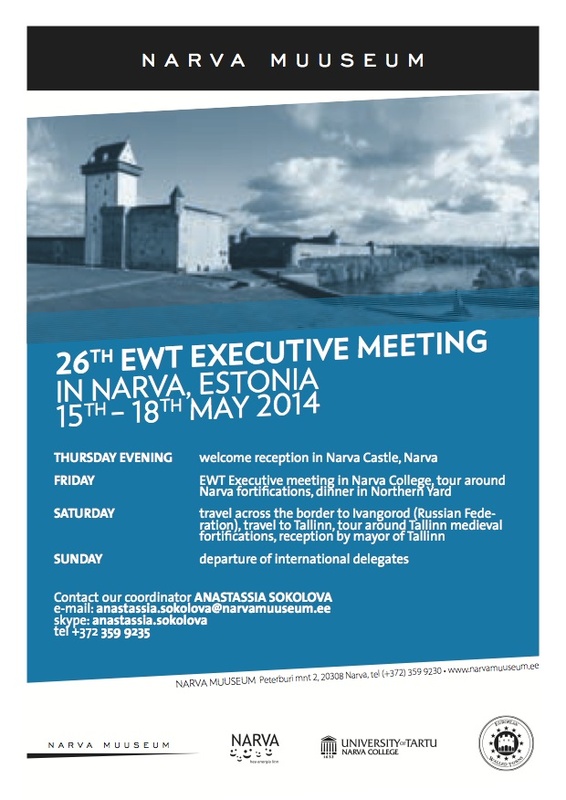 The next EWT Symposium and AGM was held in Chichester, England, UK in September 2014.